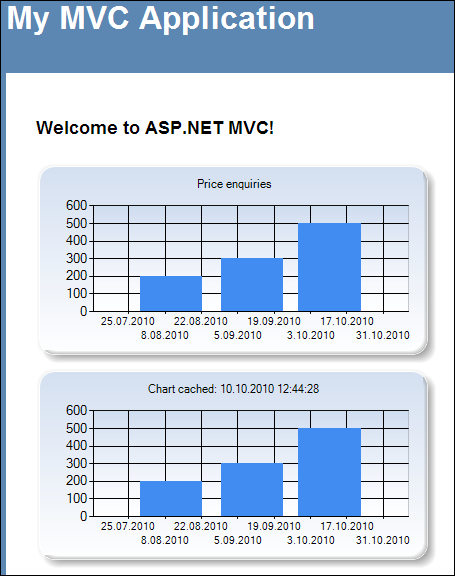 In my previous posting about charts in ASP.NET MVC 3 I gave you basic idea about how to use them. In this posting I will show you something cool – we will optimize performance of our application by caching charts so we don’t have to generate them on every request. You can find source code of this example from my GitHub repository. Chart example is located in Experiments.AspNetMvc3NewFeatures solution. Project name is Experiments.AspNetMvc3NewFeatures.Razor. Let’s starts with example form previous posting where cache was not used. I added cache example as different action to my application to illustrate that cache support can be added using only couple of lines of code. Take a look at this code. We use constant key when dealing with cache. If we get chart from cache then we use the cached version. If there is no cached version we will create new chart, bind it to data and cache the instance. In this code chart is saved to cache for one minute. After that cache expires. And here is the result of our work. You can test caching by refreshing the page and reading the title of second chart. The title changes after cache timeout that is 1 minute in our application. Although upper chart does not change it is created again and again for every request. We took code example from my previous posting and added couple of lines of code to it so our charts are cached for one minute. It was extremely simple change that took no markable amount of our time. You can change the cache timeout and you can also turn on sliding expiration if it fits to your scenario better – just modify the last two parameters of WriteToCache() method. Published at DZone with permission of Gunnar Peipman . See the original article here.